Domed Titanium Ring with Inlay and Tension Set Round Gemstones: Sapphire, Ruby, Alexandrite. 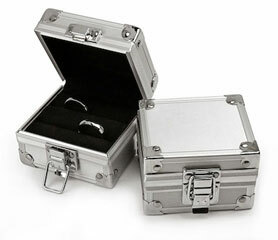 Tension setting is one of the most striking stone set designs. It permits a full side view of the stone and also lets more light to reflect through the gem. When light enters the gem from all angles it makes the stone more sparkly and live. 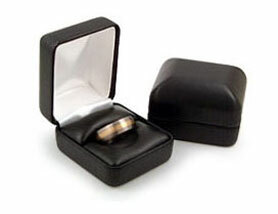 Tension set ring holds the gem on two sides with constant pressure. The entire ring acts as a spring. That's where the unique properties of titanium come to play. 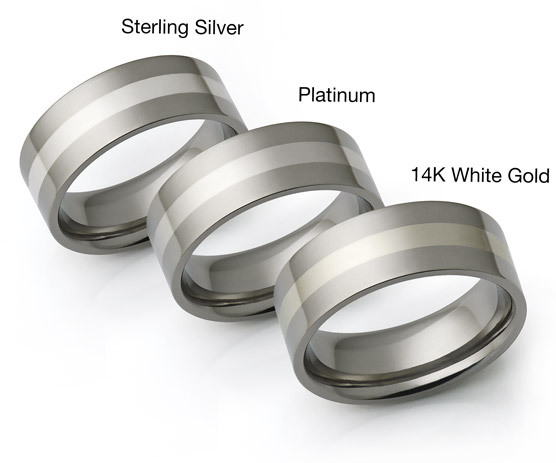 Due to the incredible strength and natural "memory" titanium ring holds the stone securely with less bulk (traditional gold or platinum tension rings use more metal to beef up the ring). 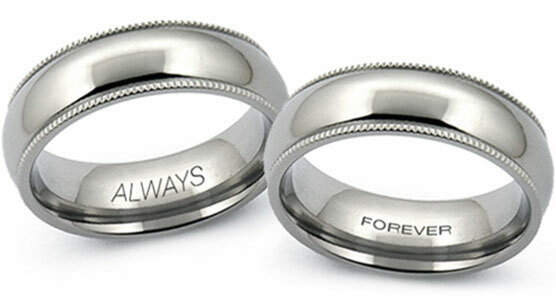 Each tension set titanium ring is custom made for selected stone size and finger size. 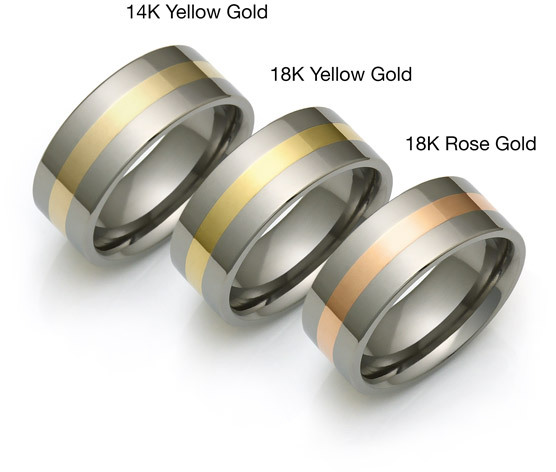 Available with 14k White gold, 18k Yellow gold, 18k Rose gold, Platinum or Sterling silver inlay. 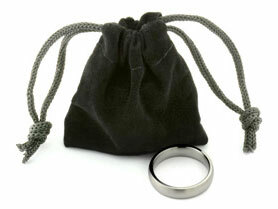 The ring is shown with 3mm round stones and 7mm wide. All gemstones are genuine, High Quality and Very Good cut. We ofer both natural and lab-grown stones for this ring. Choosing lab-grown stones gives an advantage of having the best possible color and clarity gems, at a reduced price. Available highly polished, with an absolute mirror-like finish, or brushed - also called satin finish. Short YouTube clip showing this ring with various stones and inlays. I ordered a custom ring from this site that is similar in style to this ring (mine is flat with beveled edges and a wider inlay). I had something specific in mind so I sketched out a rough idea of what I wanted and explained it to the fine folks at Avant Garde. A few days later the ring I had seen before only in my head had arrived at my door. It's absolutely perfect! I had a 4mm Moissanite stone set in the band, and it looks brilliant - no doubt the tension setting allows more light onto the stone giving it that extra bit of luster. Thank you, Avant Garde! I am now the happy owner of a truly beautiful ring.